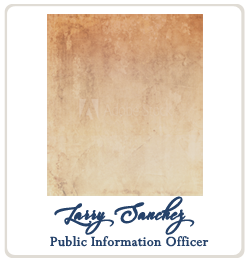 We are the main point of contact for information and interview requests for the County Commissioners Court and the county departments that fall directly under their supervision. Judicial records of all types are typically open records, but do not fall under the guidelines of the Texas Public Information Act. They are maintained and protected exclusively by the District Clerk (for district court cases), the County Clerk (for County Court at Law cases) and the Justices of the Peace (for small claims, evictions, traffic cases, etc.) Judicial records must be requested and obtained from the clerks of these courts, not this office. •County Clerk: land records (deeds), liens, business filings (assumed names), vital records of all types, cattle brands, beer and wine applications, foreclosure postings, military discharges, marriage licenses, and more. •Tax Assessor & Collector: Property tax statements, vehicle registration. •Public Notices: Public meetings, hearings, minutes, general announcements, meeting video archive.